Being a Restaurant Reviewer in Los Angeles has its perks. Last night I attended a 10th anniversary dinner party at Scarpetta in Beverly Hills. 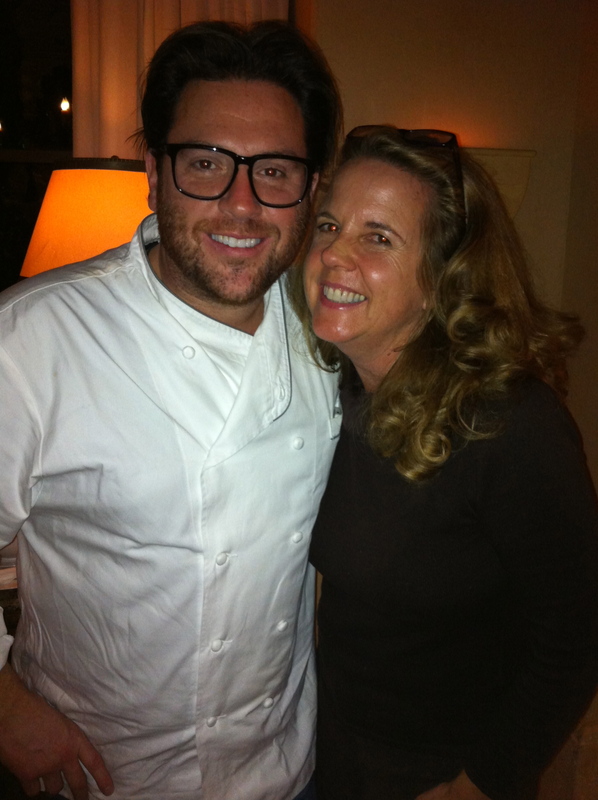 I was excited to enjoy a one-of-a-kind celebratory dinner at the Montage Hotel Beverly Hills and to meet celebrity chef Scott Conant. Working side-by-side with Conant was Chef Alessandro Stratta of Scarpetta Beverly Hills; Craig Strong of Studio at Montage Laguna Beach; and Shawn Armstrong on Montage Deer Valley. These esteemed chefs creatively scurried around one of the most beautiful restaurant kitchens in the world. When Scott Conant walked into the kitchen of Scarpetta, we instantly felt his energy. He is a brawny and charaismatic chef. Conant is like a professional quarterback walking onto a field to lead a team to victory. He reminds me of the Captain of a ship on a transatlantic sailing when he is in the kitchen. All of the chefs in the kitchen are accomplished, however Conant has an air about him. His Scarpetta restaurants can be found in New York, inside the Beverly Hills Montage, inside the Cosmopolitan Hotel in Las Vegas, at the Thompson Toronto and in the Fontainebleau resort in Miami Beach. Conant is an extremely busy chef and television personality, as guest judge in Top Chef, Chopped, guest on Martha Stuart Living, and as host and Head Judge of 24 Hour Restaurant Battle. We toasted to the evening with a glass of Prosecco and nibbled on bite size creamy polenta cups with wild mushrooms and simple raw yellowtail with a pinch of sea salt and pickled red onion. Then we all sat inside the private Chef’s Table dining room to enjoy four signature dishes from each famed Montage chef. Our first course was served to us as chef, Alessandro Stratta explained how he created his Maine lobster risotto with saffron. The Meyer lemon, poppy seeds, red peppercorns and saffron enhanced the flavors of the large hunks of lobster. It was absolutely extraordinary risotto. Cooked perfectly into a creaminess, yet I could taste each single grain. This perfect dish was paired with an Italian Berg Gravner, Friulli, 2010. Leaving the table, I walked into the kitchen to watch Chef Shawn Armstrong from Apex at the Montage Deer Valley resort in Utah. 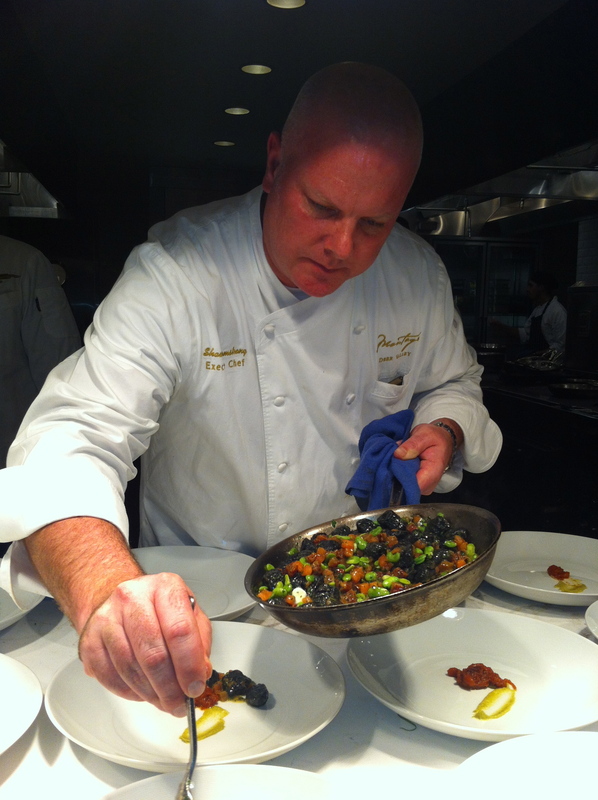 He was preparing our second course, as he sautéed brussel sprouts with sun choke chips, green garlic, fava beans to be the bed for his striped bass with coal-black gnocchi. The delightful gnocchi did not get its color from squid ink, but from a charcoal cooking process. It was intertwined with the crisp vegetables. The restaurant’s Wine Captain paired this dish with a taste of red Suber Daino to enhance the dish with a Sicilian personality. Sitting back at the Chefs dining table, Scott Conant did not enter with his critically praised signature dish, his spaghetti with tomato and basil. It’s the true elegance of simplicity. Instead, our entrée was a sirloin of Kobe paired with Conant’s signature braised short ribs of beef. The delicate meat looked like a piece of dark fudge next to the Kobe sirloin with flash fried spring vegetables and wild mushrooms. The surprise of this dish was a beef bone sliced in half and filled with luscious marrow, parmesan and leeks. It was baked into a gratin and sublime. 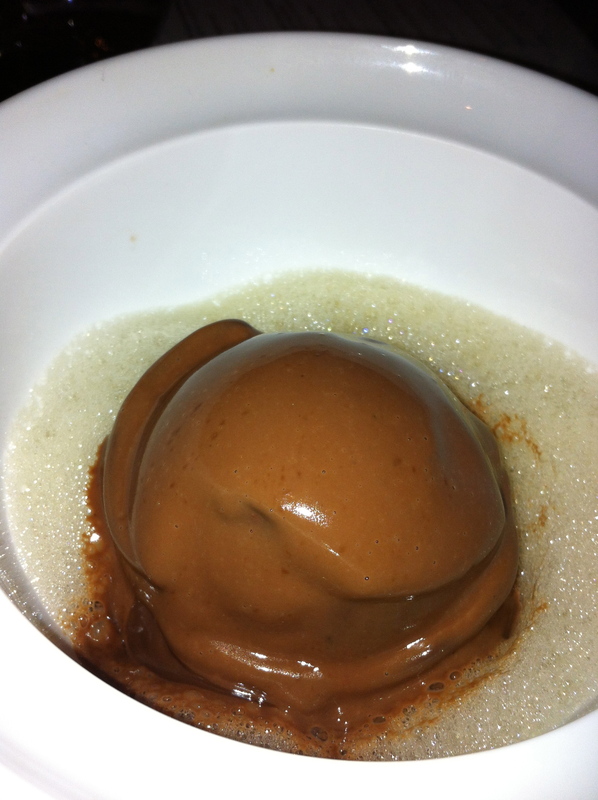 Last, was a bowl with a Guanaja chocolate sphere with sea salt caramel ice cream. It’s a dark chocolate that comes from Guanaja Island off of Honduras. It sat in the middle of Guinness foam. The server poured hot milk chocolate on top of the sphere and within seconds it started to melt like an Italian Affogato. The main goal in 2013 for the Montage Resorts is to make memories for guests during their stay. I will always fondly remember this evening. Upcoming Dinner: You too can experience a dinner at Scarpetta inside the Montage Beverly Hills with the upcoming Caduceus Cellars & Merkin Vineyards on Sat. March 23 at 7 p.m. The celebrated culinary arts meal will include Chef Alessandro Stratta’s delectable five-course tasting menu to pair with different wines. The menu includes roasted Sea Scallops with oven dried tomatoes & Heirloom beans with basil, pink grapefruit & lobster roe. It’s paired with a 2011 Merkin Vineyards Chupacabra Blanca. Next, an egg ravioli with ricotta, chard & aged Parmigiano with brown butter & sage. It will be served with a glass of 2010 Caduceus Cortigiane Oneste. The third course is a crispy Daurade with caramelized endives & Guanciale in a red wine sauce with a glass of 2010 Caduceus Nagual de la Paciencia. Enjoy braised veal cheeks with candied shallots, served with potato gnocchi and robiola cheese. It’s paired with a glass of 2011 Nagual de la Naga. Finish with a selection of regional Italian cheese with grilled bread & dried fig condiment and a sweeter 2010 Cadudeus Anubis. The cost is $200 per person.